Hospitals have a complex web of electronic health record vendors but once data sharing broadens it will open the door to innovation. The thorny matter of interoperability in healthcare, as it is or has historically been in other industries, is almost all-consuming among technology vendors and their clients. Indeed, a big part of the problem is exactly how many EHR companies are out there and, more specifically, the average number of platforms hospitals are running today. It’s 16. That’s right: 16 distinct electronic health records platforms, according to statistics HIMSS Analytics pulled from its Logic database looking at 571,045 providers affiliated with 4,023 hospitals. Wait, there’s more. Most hospitals have at least 10 EHRs in place and only two percent are down to just a pair of platforms. HIMSS Analytics Chief Revenue Officer Mitchell Icenhower explained that the number currently in place doesn’t come up quite that high if you take out specialty EHRs — but doing so is no simple matter. 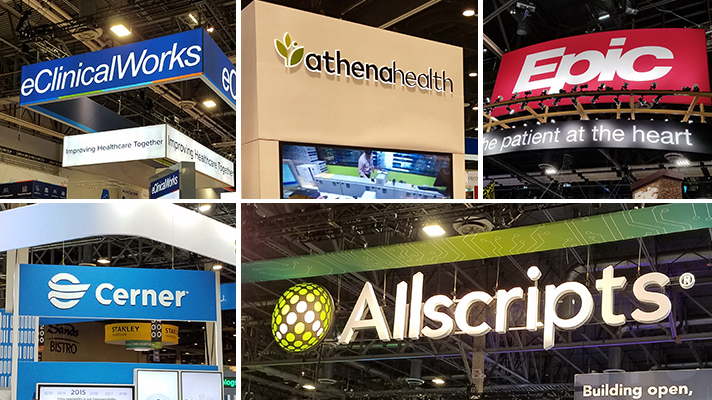 “The bottom line is there are a lot of different technologies at play here and many of these may be specialty EMRs that won’t be displaced by core vendors, such as behavioral health or oncology products,” added HIMSS Analytics Executive Vice President Blain Newton. The plot twists even more when considering both inpatient and outpatient settings. The average health system, in fact, has 18 different EMR vendors when looking all the way across affiliated providers. It’s not just the reality that implementing, running and maintaining all the different products have created something of mess, either. Healthcare as an industry needs interoperability to be able move forward now that the system is digital. Now, about those vendors. In the inpatient setting there’s a whole heap. The above data points to the healthcare industry’s need for ONC and the Centers for Medicare and Medicaid Services to lead the drive toward interoperability. Here’s the enormous upside, though: True interoperability will spark innovation and not just between EHR makers competing for best of breed but, more important, among innovators that don’t even sell EHRs as health data starts to flow. That’s the scope of the interoperability problem: When tech vendors and hospitals enable data to flow more effectively, the real innovation can begin.